One of the more frequent complaints about Superman is that he's too overpowered to be interesting. I've been making similar comments about the Hulk lately. One-Punch Man takes that idea and runs with it. 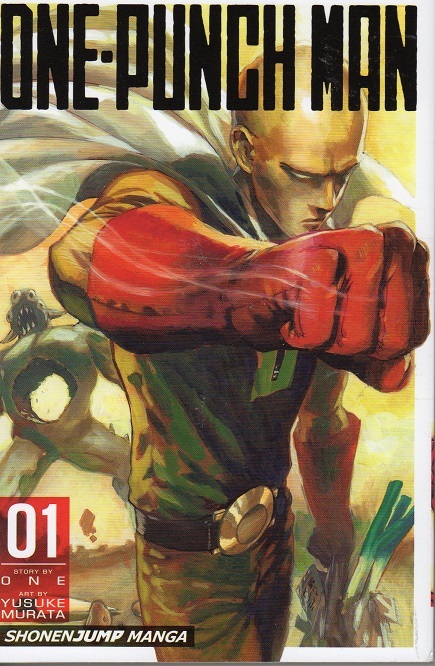 One-Punch defeats all of his enemies with... you guessed it: one punch. This time, however, it's not the readers who grow bored, it's the hero himself. What he wants most out of life is a challenge! And One writes him many. If it takes a single punch to defeat a single enemy, how would he do against an army of enemies? Still too easy? How about if they were the size of insects? This is clearly a writer having fun and the results are action-packed and hilarious. I've not sure that the premise won't wear itself thin, but the first volume is great enough. Murata's art is also superb. Sharp lines with hatching and crosshatching to achieve way more detail than I expected in a trade manga series, it reminded me of Katsuhiro Otomo's Akira at times. That's not a small achievement!